I wrote a post yesterday on defining functions in R for beginners. By “beginners” I mean either people who are just learning R, or are just starting out in data analysis, or both. Today I want to show how this might be easier to do in Mathematica®. The code “Cases[data, x_ /; Abs[x – mean[data]] <= k*StandardDeviation[data]]” keeps those instances, called x, of the data set that are within k standard deviations of the mean of the data. The “List” option tells Mathematica® to import the data string as a formatted (ordered) list, which in R would be seen as a vector. Well, that’s it … the result could have been written very nicely in Mathematica® and saved as a PDF, or as a CDF and placed as an interactive document on the Web. R has similar capabilities, so you pays your money and takes your choices. I just feel data analysts should be aware there is a choice. What is a function, anyway? For programming purposes, one should think of a function as a type of object that takes certain types of INPUTS, and – once those inputs are given – produces a definite OUTPUT. The “object” that acts as input to the function is a finite list of numeric data. The “object” that is output by the function is a single numeric value. The function itself is also an “object”. You can define functions yourself in R using the function command. When you create a function it is an object, that can be used in R like any other object. The function body. This is the entire code inside the function. The function arguments. These are the types of input needed for the function to work. They are specified in the body of the function. The function environment. This is a specification of the location of the inputs to the function. In this example we use a function to compute the fraction of data points, from a given data set, that lie within standard deviations from the mean. We INPUT a vector of numerical data and a positive number . Note that the input vector is a single object in R: it has numerical components, yet so far as R is concerned it is a column vector (= an ordered list). 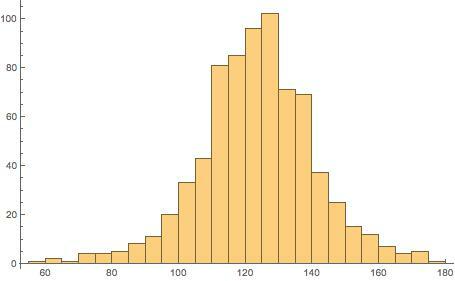 We OUTPUT a single number: the fraction of data points, from , that lie within standard deviations from the mean of . In specifying this function we will do something that is very common – we will make use of other, existing R functions, such as mean and standard deviation (among others). 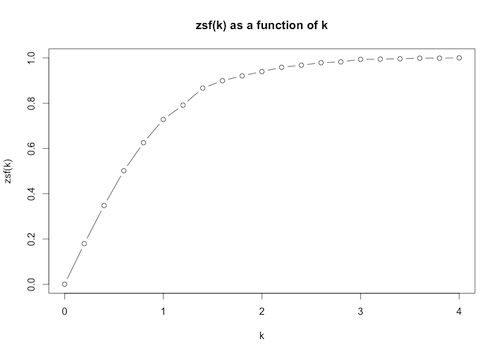 Let’s name the function zsf (for “z-score function”). and we have to fill in the arguments and the computations to get the output. Note that the functions mean and sd are part of the R stats package, which loads automatically when you open R.
So, approximately 72.8% of the data is within 1 standard deviation of the mean. 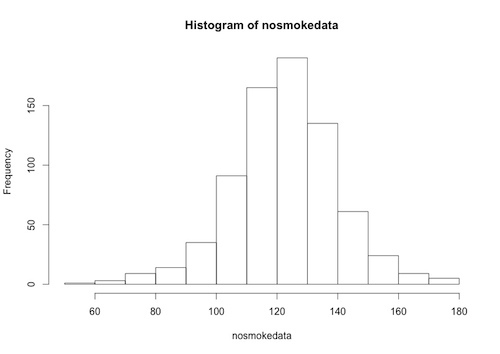 Given a data set, such as the “nosmokedata” above, we can vary k and plot the fraction of data within k standard deviations of the mean, as simply a function of k (with the data as a given: in other words, with the data argument fixed). First we need to calculate a potential range of values for the variable k.
and so see that all the data lies within 4 standard deviations of the mean. 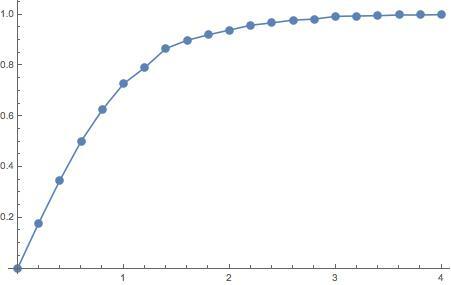 Now we apply a function of 1 variable, k, to this vector of values. The plot allows us to see visually how the proportion of data within k standard deviations of the mean varies with k.
Note: the option type=“b” in the plot function draws both points and lines. A skilled R programmer could have done this quicker and slicker: I hope I have laid out enough information so that you can see how functions are defined, can be applied to vectors, and plotted to give useful visual information. Having defined a function such as the zsf function above, we would like to save it for future use. Customizing R at Quick R byRob Kabacoff has a useful discussion on loading user-defined functions into R on startup.